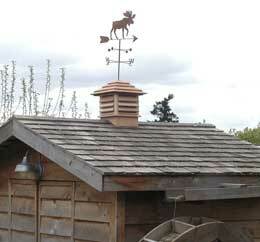 The RunnerDuck Projects page, a place to find all types of landscaping projects. This project is pretty involved but as you can see from the picture it is very rewarding. This waterwheel is 5 1/2' in diameter and 12" wide. It is only ornamental and does not grind grain or generate any power. Landscaping a new or existing area can be a real challenge. We hope our landscape project gives you a few pointers to help make the job a little easier. 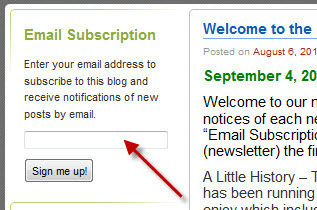 We'll share with you not only the "how to" but also our mistakes. This project includes a waterfall, pond, gardens, grass and bridges. We hope you enjoy this very large project. Now that the sun is coming out more we are starting to grow lots of algae in our fishpond. We were going to put in a filter last year but just didn't get around to it. We've been scouring the Internet for a good bio filter design for our fishpond. We've been talking with lots of people that have bio filters as to what works and what doesn't. We took what we think is the best of each and created this easy to build filter system. 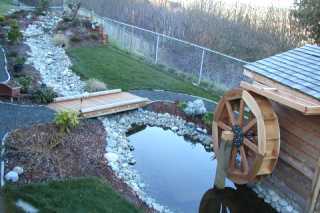 This waterwheel comes to us from Gary Mastolier in Bonners Ferry, Idaho. 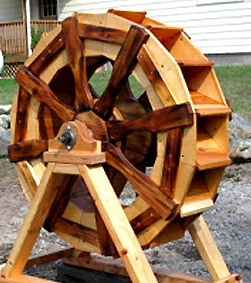 We love it when people share their woodworking plans with us and Gary did a wonderful job on this waterwheel.